Our products are 100% reclaimed. This granite curbing is 6" thick and 24" tall! Lengths are 6-8'. One side is consistently flat and all sides are split or hand tooled. These pieces would make a phenomenal set of stairs. Samples are available for viewing at our office or we can ship them to you. If you were forwarded this discovery alert and would like to receive your own copy, sign up here. Have Bricks or Stone to Sell? Experienced Brick & Stone will be happy to visit your site and provide a quote for the purchase and removal of any materials that may be suitable for reclamation. Copyright © 2014 Experienced Brick & Stone, All rights reserved. 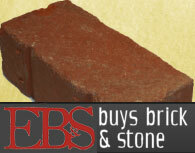 You are receiving this email because you expressed an interest in receiving information from Experienced Brick & Stone. Thank you!